ALKEM Industrial Supplies is an Australian family owned company second generation. Established in 1980 in the Brisbane area in Queensland, the business has diversified and specialized in a vast range of industries including: Engineering, Steel producers, General Industry, Mining, Transport, Railways, D.I.Y. and so on. As the company has expanded, it has given us access to Major Tooling, Chemical and Associated Suppliers of all Engineering requirements, this in turn has allowed ALKEM Industrial Supplies buying power to become competitive with all major suppliers to the engineering industry in Queensland and Australia. These are the 5 values that we have and share with our customers for more than 35 years. 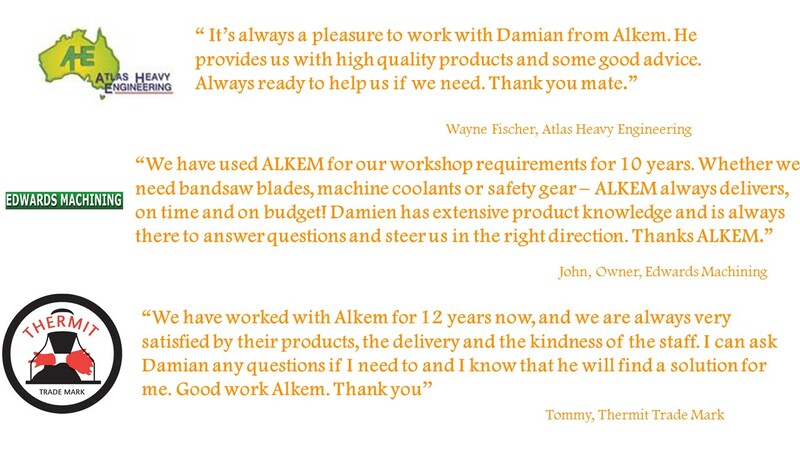 At ALKEM, our mission is to exceed our customers expectations and to satisfy their needs. We focus on building great relationship with our customers with old school face to face service. ALKEM Industrial Supplies prides its reputation on courteous, personalised attention to our customers at all times by our staff members. In addition, what makes us a very reliable company is our excellent deliveries and turnaround times.